Christmas Eve Eve we went to the lake and did Christmas with Granny and Pap Pap. We all spent the night the night before and woke up and ate breakfast and opened presents. We also had lunch and fondue too! All the grand kids in front of the tree eagerly waiting for presents. Granny and Pap Pap gave all the grand kids an air hockey table to play with at the lake. 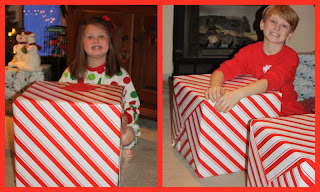 They wrapped all their presents in one big boxes this year! Brylee and Jackson ready to open presents! JP and his "bear bry@nt" hat! and getting all hyped up on sugar! Thank you Granny and Pap Pap for all our presents and lots of Christmas fun!